If this is your first time getting a Windows VPS Server, you’ll likely be more cautious and been reading a lot of information from forums to blog post. While this is all helpful, you will get confused with that kind of information and soon you will feel tired and loose interest. When it was my first time checking out a Windows VPS Server, I’ve spend the entire week reading and learning all about VPS Server. I’ve registered to different forums and comments / contact the blog owners about their reviews for every VPS Server they posted, some replied while some I didn’t heard anything. While spending time on SEO forums, I’ve heard of PowerUp Hosting and the people there are happy and recommending this provider as their Windows VPS Server. I did a couple of research for bad reviews but didn’t find any, I also contact support and asked for a couple of questions which they replied and assured my problems. During my first attempt to get a Windows VPS, I opt to their cheapest plan which is the Hyper-V lite. I wanted to test out their servers, and I don’t want to spend too much on it. Eventually, my tools outgrown my plan and I needed to upgrade. Good thing PowerUp Hosting released a deal during Black Friday and I got a new specs with lower cost. What to Look for a Windows VPS Server? Distance from the Server – Typically, the further you are, the longer the reaction times. Using VPS in a Tier 1 Network will negate this distance, unless your internet connection is poor. Quality of Connection – The better the connection, the shorter the reaction times and the snappier feel and the ease it can run multiple threads. Quality of Equipment – Using the latest technology, like on any PC will give you better performance and ability to run programs quickly and with more threads. Bandwidth speed – Probably the least important factor for link building as any server should have decent enough bandwidth. The hardware will bottleneck the operation speeds way before the bandwidth will. Operating System – Make sure it runs Windows 2008 – No linux. All SEO software runs on a windows box. “R2″ Makes it a bit like Windows 7. You Are Going To Need Private Proxies – No hosting firm, SEO friendly or not will let you operate without proxies. Get yours here, they are awesome! Upon getting my hands on my new VPS Server, I started to do several test to see how can I maximize the power of this bad boy. I installed Passmark and run speedtest.net on different time. Just to see the consistency. 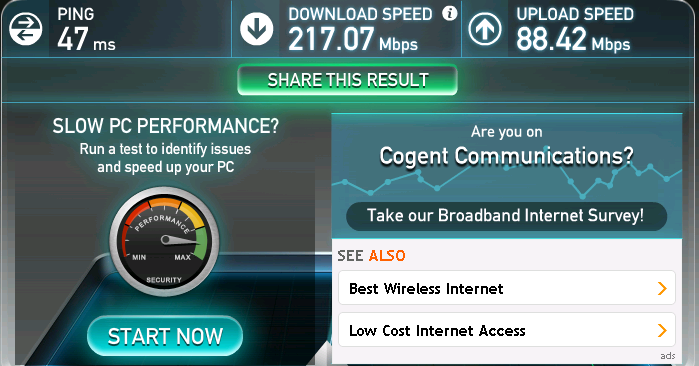 I run a speedtest and my current plan says 100MB, but having a 200MB internet connection is a plus! Any PC system real or virtual, the bottleneck is the hard drive – unless you get some SSD. 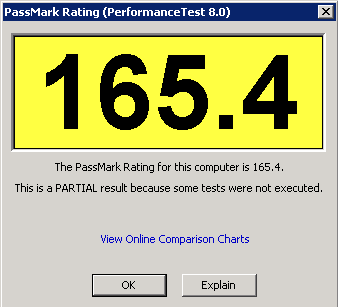 The Crystal Mark measure the rates in which the system can read and write to the hard drive. I did have some issues during the test, that’s why it says partial. Since I really like PowerUp Hosting service that I upgraded my VPS Server into SSD two, the reason is that I wanted to try the I/O speed and the faster I can build links / use my tools all at the same time. I am really happy and really recommend them. Make sure you read a lot, search and ask on forums about the provider that you’re going with. Contact them if you have questions, this will make everything easy. You can ask around about their experience about their VPS provider and check if they provide money back guarantee. If you have other tips, thoughts about PowerUp Windows VPS Server, please share on the comments and let us know about it! Show some love and share! Enter your Email Here and Be updated everytime! By entering your email, you'll get the best discounts right thru your inbox. Join our 139 subscribers now! You'll only receive coupon codes and blog updates, nothing else. What is VPS Server and Why do you need a VPS Hosting? We are a group that are addict in coupon codes and big discounts! We built this site to collect Cheap Windows VPS, Linux VPS and SSD VPS, so you can save some money before purchasing your VPS Machine. Please note that some of the links are affiliate links and I will earn a commission if you purchase through those links (at no extra cost to you). I recommend that you do your own independent research before purchasing any product or service. I only post VPS Server to where I've used them in the past, and happy with it.